What happens when we tap into the wealth within us? As you will see in this uplifting work from Charlene Costanzo, ordinary days start to sparkle with extraordinary moments, and all areas of life are enriched. In this empowering book, Ms. Costanzo shares real life examples of triumphs, transformations, and healings that result from using our inherent gifts of strength, beauty, courage, compassion, hope, joy, talent, imagination, reverence, wisdom, love, and faith. Each “touchstone” in this collection of stories can inspire us to stay in touch with our inner gifts, even when – especially when – fear, hurt, anger, or doubt has derailed us. 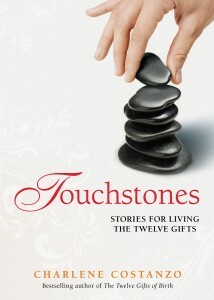 How did Touchstones: Stories for Living The Twelve Gifts come to be? In 2000, while promoting her bestselling book, The Twelve Gifts of Birth, Charlene traveled America in a motor home. It was then, while visiting schools, shelters, prisons, and places of worship, that Charlene began to watch closely for evidence of The Twelve Gifts in herself and in others. This daily practice became a personal quest, one on which she invites us to join her. The stories within are intended to spark memories, recognitions, and appreciations of times we used our gifts and to ignite enthusiasm for building our own collection of touchstones. Reading Touchstones can lead to living The Twelve Gifts more abundantly.